César Gómes put on a hitting clinic today as the Montana Pandas dumped the Echo Park Lakers 21-6 at Panda Park. The Montana center fielder made Echo Park defenders earn their pay, lashing Echo Park pitching for 5 hits in 5 at-bats in the game. He told BNN reporters after the game that his strategy was "just hit it where they pitched it." "Too often I try too hard to pull the ball," Gómes said in his postgame press conference. "Today, I just went with the pitch." César Gómes singled in the 1st, singled in the 3rd, singled in the 5th, singled in the 6th, singled in the 7th and walked in the 8th. This year Gómes has collected a .305 batting average to date with 74 hits in 243 at-bats, 29 RBIs, 7 home runs and scored 31 times. He has played in 62 games. Special Notes: 1B Dewitt Hopper was injured being hit by a pitch. 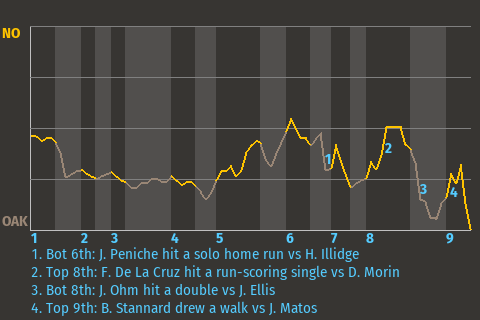 Mysterious Walker and Curt Orser were ejected in the 6th inning for igniting a bench-clearing brawl.César Gómes ties the MON regular season game record for hits with 5.